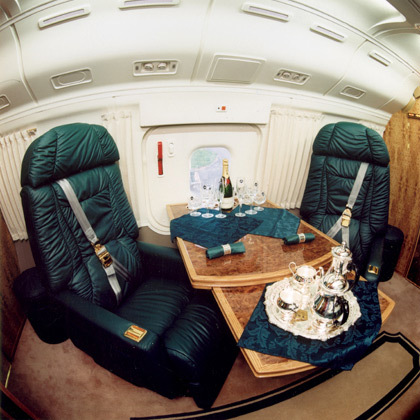 A few days ago we had big photosession of Russian president’s plane interior. These time just two photos of the Russian president’s helicopter, made on the basis of MI-8 Russian Helicopter. By the way according to Russian news media the agency which serves the Russian president’s fleet started an inner investigation in order to find the source of the information leakage. They believe that such photos should not be available to general Russian or international public. And those two photos are from the same source. Snakes? In the middle of Siberia? 🙂 BTW, does Dubbya have one with snake protection, i wonder. Must definitely be a professional photographers work because no normal person would have a camera with fisheye lens to take the second photo. A professional photographer wouldn’t get within 2km of that helicopter. If this professional photographer is not in president`s PR office. Only the best for our beloved tsar! I would like to see Blair or Bush helicopter. 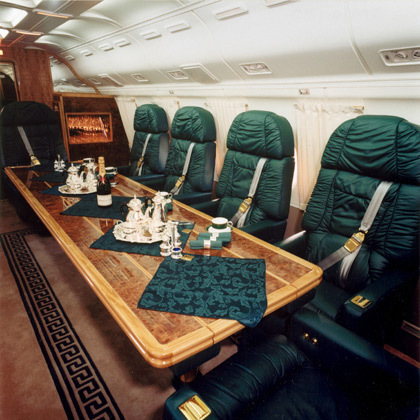 It is pretty obvious that transport of any high level official filled with some kind of luxury. my professors son is workin for US govt, his job consists of puttin right newspaper, turnin on lights, favorite tv show, put hot cup of coffee for each of the big politics in their hotel rooms. for each there are different preferences. they dont live in the real world. everythin is presetted up for them. when those politics move around the country the bring their own limo’s with them in army carriers. 1-2 millions of tax payers money for each limo flight across the country. whats the problem with nice helicopter. yeah i don’t know why he’d be ashamed that’s not over the top luxury. Put than again he’ll probably end up with it at the end his reign. But on the plus side he’ll probably be executed in it too. nice place to chat with MR PUTIN!! !